Did You Pickup Our New Lightroom Book for Free? While we’ve been sitting high on the best-sellers list for Photography books, we’ve heard from several of you asking how to get our new Lightroom book. Well, there’s two ways to get the book. 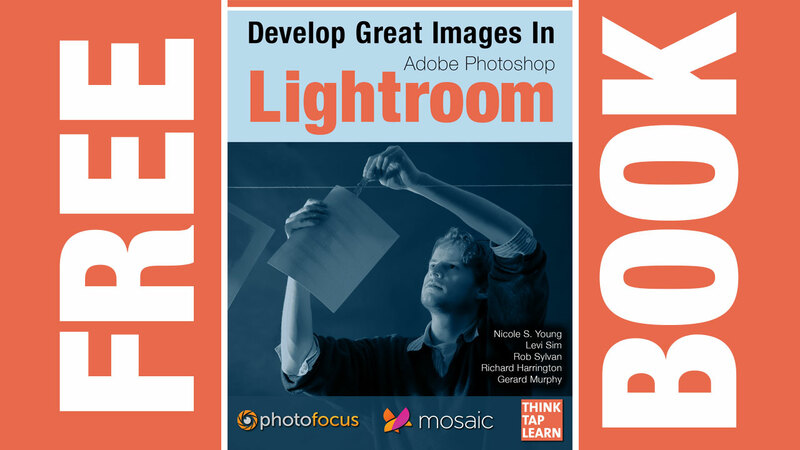 The new book is called Develop Great Images in Lightroom. In its 236 pages you’ll find practical advice and expert tips. Learn from Nicole S. Young, Levi Sim, Rob Sylvan, Rich Harrington, and Gerard Murphy. Method 1: You can get the book here... on iBooks. You will need an iPad or iPad mini to view or a Mac running OS 10.9 or newer. Method 2: For those of you without an iPad, you can read the book on Scribd or embedded here. This version doesn’t have interactive slideshows, resizable photos, or embedded video. What a great resource. Appreciate the free offer–it’s downloading on my iPad now. There’s always something to be learned about Lightroom. Unable to download as it is only available in iTunes US store and not available in other regions i.e. Asia Pacific. It’s available in all of the stores that Apple offers to carry iBooks. Check your local iBooks store. Let me be the first to say… the book is nice. But. Adobe already makes me feel foolish for using my Windows platform for using it’s programs. It seems e-book publishers love rubbing my platform choice in my face as well. No love on my laptop, desktop or Surface Pro 3. If someone made an ebook platform for windows Wes release it that way. But since there isn’t one that is either easy or free, we can’t do it. Windows users could use a pdf format?? This is perfect for the person trying to understand digital photography. It really cleared up and linked things together. I feel more comfortable exploring LR now, not as resistant to try to use it. Thank you for offering this for free. I would have paid for it ! Thank you for your feedback, Stan–we thrilled it helped. Would you mind writing a review on iTunes? Any chance for Google Play Books to be an option? I hate juggling multiple ebook platforms and I’m not an iOS user. I basically had to download the Scribd app on my Android tablet JUST for this book. The other day, same scenario for another ebook. I’d like 1 unified system… hell, if you offered an option to download the epub file directly, we could choose our own platform but I understand that has implications with copyright and the temporary free period of this book. We’ll check it out, thanks for the tip. One of the problems with an epub file is that it loses all the great interaction Rich has created for this book that really makes it a rich reading experience. We’ll look into Google Play Books. Are there any ways to download ePub version for iPad from other sources? I was able to download it in iBooks Canada for free. Thanks for this great resource! I found it very informative. However if this was truly a free ebook you’d have released a .pdf version with the before/after images shown in sequence in addition to, or instead of, the platform-locked ibook nonsense. At the very least, downloading of the gimped scribd version could have been allowed. It’s a great book, but it’s not a free ebook, and promoting it as such is disingenuous. Great book so far, learning a lot, luckily the office lent me a Mac. The iBooks lock-in is a problem tho, for 1 we all don’t have Macs or iPads, for 2 Scribd is a crappy alternative. Maybe try a PDF with DRM (http://www.adobe.com/manufacturing/resources/drm/) since tracking is important to you. PDF’s are more ubiquitous and reliable, and work on most platforms. As someone said earlier, I can’t view this on my Surface which would be awesome for learning on the go. The Scribd Surface app is just a useless web container for the website which means it has the same lame/poor UX from the website. This guy (http://robertrodriguezjr.com/insights-ebook/) utilized the iBooks + PDF combo, of course, I downloaded the PDF. Also I had to switch to the US store to buy the Book, because my Jamaican account couldn’t access it. PDF copy protection is crap. I can crack it in less than 5 minutes. Sorry. Free content our choice of where to distribute. When the book goes on sale for dollars next month well open up more platforms. Cool, seems reasonable. Good book all the same, thanks for the free version. By the way, which version of Lr is targeted by the book? The book is written with Lightroom 5, but most things are the he same in Lightroom 4, except for some new tools. Many of huge processes will work all the way back to LR 2. Let’s be honest, you’re not “giving it away”. You’re letting me read it as long as it’s through iBooks or SCRIBD on which I can’t download it. Only read it online or via their app. I appreciate it being made available but that’s what you’ve done. Steve… its a damn shame that this TV shows you watch for free can only be watched on a TV set and that music you stream with Spotify only works in their app. Our book, our hard work. Thanks for being so ungrateful… real motivator to keep giving away things. How can I delete images from Mosaic that I have already deleted from Lightroom? Or that I now want to delete from Mosaic? Short of removing and replacing everything? Honestly I really thought lightroom was just for easy picture filter edits. I’m interested more about this and certainly would want to download your book!